Explore the least explored rural facet of Rajasthan at its best through a trip to Ranakpur. 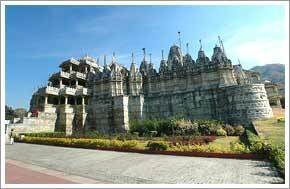 Ranakpur is a small beautiful village bestowed with traditional customs. Nestling in a remote valley of the Aravalis, the City of Temples – Ranakpur fascinates one and all. The climate in Ranakpur is extremely hot during the summers. On the other hand, winters are not too chilly here. Therefore, the best time of the year to explore the exceptionally beautiful village Ranakpur falls between October and March. Dabok airport near Udaipur is the nearest air connectivity from Ranakpur. Falna is the nearest railhead from Ranakpur. Buses and private taxis are available to Ranakpur from Udaipur. It is just a 5 hour drive from Udaipur. A well developed network of roads connects Ranakpur to other nearby cities within the state. Ranakpur is packed with several accommodation options to suit every taste and pocket. The rich and royal travellers can stay at Maharani Bagh serving as a luxurious halt in Ranakpur. Best of the facilities and amenities are available at this luxury hotel that was made by the Maharani of Jodhpur earlier as a palace for personal use. Then there is Fateh Bagh which is a 3 star hotel. It has 20 spacious rooms and is equipped with all the modern amenities. Savour the lip smacking multi-cuisine dishes served by the restaurant of this hotel. Ranakpur Hill Resort, Shivika Lake Hotel and Hotel Shilpi are some of the economy hotels in Ranakpur. A foodie can step into the Roopam Restaurant that offers some delicious dishes to its guests. Or you might drop in at the restaurant of the luxury hotel, Maharani Bagh. Experience sumptuous dining with a variety of dishes from different cuisines that are available here. Take your pick. Ranakpur is known far and wide for the exquisite temples it houses. From times immemorial, the Jain Temples have attracted a number of visitors to this place. A combination of the Hindu and Jain architecture, these temples never fail to mesmerise the viewers. In every corner of the Ranakpur Jain Temple, art exists in its best form. The gracefully done up interiors speak aloud of the skills of those human hands that created them. The ancient temple nestles in the Aravali ranges. It is one amongst the five most important pilgrims of the Jainism. Built all in white marble, the infinite pillars each with a unique carving leave the visitor speechless. There are several smaller temples inside the complex of the temple. These are also worth a visit. A trip to Ranakpur in Rajasthan lends a pleasurable impression of the desert land and the holiday becomes enjoyable than ever if you choose to travel with us.